New Year greetings to all our Tech4Good members! 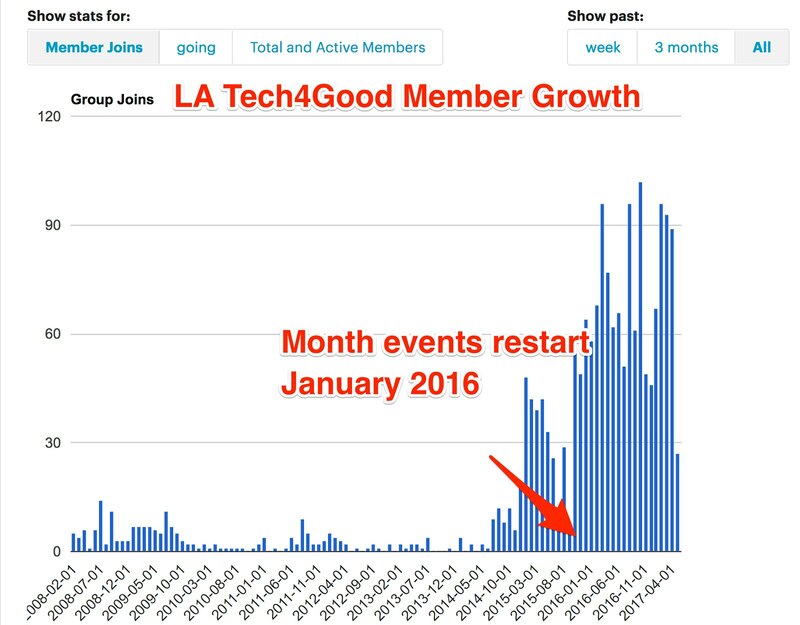 When LA Tech4Good moved from infrequent events to hosting events every month like clockwork they saw a HUGE increase in growth of active and total members. The takeaway: more events = more members = a healthier group. #LAtech4good: See You in 2018! We'll be taking a holiday break in December, after two great November get-togethers, and we'll see you in January with new programming. Hi to all our Tech4Good members! Here's what's on our summer calendar – we're looking forward to seeing you soon! LGBTQ & Tech! How do you use it? Can tech bring us together? #LATech4Good Video: Can We Measure Social Impact? Lots going on in the next month! Speakers to be announced real soon!